While wealthy industrialised nations are struggling to find ways to encourage their populations to adopt solar energy, a small energy company in the Lao People's Democratic Republic (PDR) has teamed up with poor rural communities to bring them green energy. Of the 5.7 million people living in Laos, only 48 percent are connected to the electrical grid, mainly in towns and cities. For the rest of the country, access is limited because of problems of infrastructure and affordability. Without power, these communities rely on environmentally unfriendly energy sources, such as firewood and kerosene. The government says it is committed to electrifying 90 percent of the country by 2020 but it will be a near impossible challenge, according to specialists, given that most rural communities are costly to reach with electrical lines and transformers, and residents of such communities cannot afford expensive electricity. Solar-powered systems are a logical alternative. But start-up costs are prohibitive in a country where 74 percent of the population lives on less than US$2 a day. However, one Lao company, Sunlabob Rural Energy Ltd, www.sunlabob.com has had some success helping poor villagers access such electrical supply by renting out solar-based systems. Suresh Balakrishnan, a UN Development Programme (UNDP) senior technical adviser in administrative reform to the government, believes the Sunlabob initiative is a sustainable model that gives communities the opportunity to help themselves without subsidies. "I was quite fascinated by how [the company] had created an exciting market-based opportunity in place of conventional development assistance." Solar-powered lanterns are available to rent at a price that is competitive with polluting kerosene lamps. After 15 hours' use, the lamps are recharged, for a small fee, from the village's central solar-power collection facility. All fees go towards maintaining the central solar recharging station. Another option is the home system model. Sunlabob trains Lao franchisees to install solar photovoltaic equipment in their villages and trains local technicians in maintenance. The franchisees act as back-up technical support to the village technicians. The equipment is rented to a village-appointed committee, which then sub-leases it to households at prices it sets. Rent covers all costs, including replacements and operational servicing costs. In the event of breakdowns, rent payments are suspended until repairs are made. The third option is designed for larger villages. It utilises solar, hydro and generator power, creating an electrical grid with sufficient energy to power a variety of ventures, such as health clinics, rice mills and water pumps. The programme is proving highly successful, particularly the rental model, which avoids the high start-up costs that would normally prevent poor communities from accessing solar technology. Sunlabob's appeal is in its different solutions without outside subsidies while ensuring reliable servicing. Putting the community in charge of the process has also ensured sustainability. "That was one of the things that really impressed us. In the village there had been previous attempts to provide electricity but they failed because they required outside maintenance. But having a trained franchisee and village technician gets around the sustainability problem and also provides entrepreneurial and technical skills to villagers," Grace Nicholas, the former head of the Northern Program (Laos) for the World Food Programme, told IRIN. "Light is such a small thing but it means people can avoid accidents, they can work later in the forests, and increase their livelihoods." 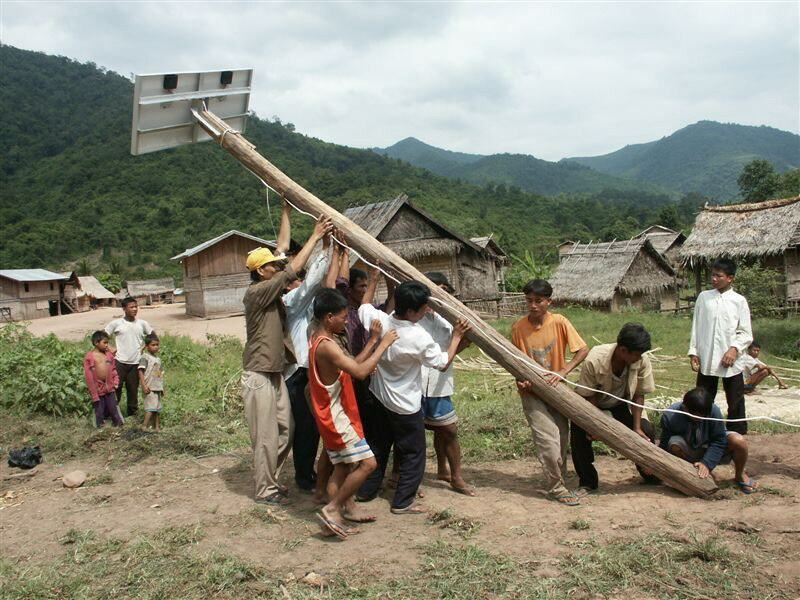 To date, 1,800 solar home systems and 500 solar lanterns have been rented out to families in 73 villages in Laos. The company is seeking to extend the project into Cambodia and Indonesia, with other potential opportunities in Asia, Africa and Latin America being explored. The Sunlabob programme recently won the UN Environment Programme's (UNEP) Sasakawa prize, which is awarded to sustainable and replicable grassroots projects that make significant contributions to the protection or maintenance of the environment. The company also works with the local orthotics and rehabilitation organisation, COPE, recycling the polypropylene off-cuts from COPE's prosthetic limb production to fabricate components for Sunlabob's solar equipment. Ruth Baker, prosthetist with COPE, is enthusiastic. "In an era of climate change it is comforting to know that through a collaboration such as this, a prosthetics team can still make a contribution to minimising global warming. You could say it's a step in the right direction."